In this edition, John answers questions on Wesley Fofana's try record, cricketing brothers, close games and inexperienced English combinations. David Morton of Scotland, the first Test player to achieve the feat, is also the only forward in the above list. Gallion is the only scrum-half, while the rest scored as threequarters. Hopkins (whose debut was against Australia in 1908), Celhay (while France were banished from the Five Nations in the 1930s), Guscott (whose debut was against Romania) and Cueto (who made his debut in autumn Tests) were the only ones who did not score their tries in Four, Five or Six Nations - matches. J A (Jack) Spoors, who was never capped by a Home Union, scored tries in each of his three Lions Tests in South Africa in 1910. Jeff Butterfield did so in his first three Tests for the Lions, in South Africa in 1955, but he had already played 11 times for England. K S "Snowy" Svenson was the first to achieve the feat for a Tri-Nations side, scoring in his first four Tests (against Ireland, Wales, England and France) during the 1924-25 "Invincibles" tour. He never played in an All Blacks Test again. There are two stand-out performances in this respect among his Tri-Nations colleagues. The big Aussie wing, John Ryan, made six Test appearances in 1975 and 1976 and scored tries every time (finishing with nine altogether) before switching to the League code. More recently, Doug Howlett went one better for New Zealand between 2000 and 2001, scoring tries in each of his first seven Tests. Howlett's achievement was the more remarkable for the fact that three of his try-scoring appearances were off the bench. The top six ranked IRB teams - at lunchtime on March 5 - were New Zealand, Australia, France, South Africa, Wales and England. The past 50 games between these six stretch back to the November Tests of 2009. Of these, 21 have finished with seven or fewer points (one score) between the teams while 14 had from eight to 14 (or two scores) separating them. It's not a bad indicator of how tight matches among the best have become. The average margin (as measured by the mean) is quite large 11.72 points (in the two scores category), but the surplus that is most common is for results where the teams are separated by just one score. That's what the public want, but arguably the figures are not that significant given the mean. However, narrowing the database down to the last 15 games (from where the top sides have been converging on their current ratings) takes matters back to the start of August 2011 - the World Cup warm-up game at Twickenham between England and Wales. Of the 15 games played between the top six since August, 11 - the overwhelming majority of them - have ended with a converted try or less between the teams, while the mean difference is only 6.60 points (so also within the one score margin). Three of the remaining four games ended with 14 or fewer points between the sides. That's a very encouraging indicator for the game's shop-window. The four recent matches bucking the trend were: New Zealand 20-6 Australia (Rugby World Cup semi-final), New Zealand 37-17 France (Rugby World Cup Pool game), South Africa 18-5 New Zealand (when Graham Henry fielded an experimental XV during the Tri-Nations) and Wales 19-9 England (the Cardiff Rugby World Cup warm-up match, which was hardly a walkover win). Steven Bates played his sole rugby Test for New Zealand against Italy as a replacement in 2004. His cricketing brother has featured in limited-overs representative matches but has not yet appeared on the Test stage for New Zealand. The best example of Test-playing rugby/cricket brothers are the Olds from Yorkshire. Alan played Test rugby union for England 16 times between 1972 and 1978 and toured South Africa with the 1974 British & Irish Lions. His brother Chris was a bowler in 46 Test matches between 1972 and 1981. The Turnbull brothers, Bernard and Maurice, both played Test rugby for Wales between the wars. Maurice was a member of the first Welsh side to win at Twickenham, in 1933, and played nine cricket Tests for England between 1930 and 1936. Reg Hands, who played rugby union for England twice in the team that won the 1910 Five Nations Championship, was a South African Test cricketer whose brother Philip also played Test cricket for South Africa. Reg played one cricket Test - against England at Port Elizabeth in 1914 - and actually batted (very briefly - he was out for nought) with his brother during the first innings of the match. A third Hands brother played in unofficial cricket Tests for South Africa after World War One. All three were Rhodes Scholars and won rugby Blues. Arguably the most prominent father/son Test players with "cross" caps for rugby/cricket are Dave and Bob Cowper of Australia. Father Dave won nine rugby union caps between 1931 and 1933 as a strong-running threequarter. Bob was a fine batsman who scored 2,061 runs (including 307 against England at Melbourne in 1966) in 27 Tests between 1964 and 1968. This list is probably far from complete. It would be interesting to hear of other families with Test rugby/cricket siblings or close relations. The oldest England player on Test debut was Fred Gilbert, who was nearly 39 when he played fullback against Wales and Ireland at the beginning of their 1923 Grand Slam season. 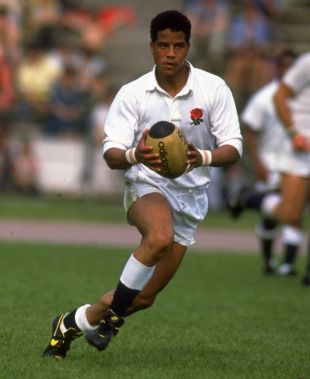 Gilbert played for Devonport Services and represented the Royal Navy in the Inter-Services championship. In 1923 he was a Chief-Shipwright serving aboard H.M.S.Vivid. During the match against the Army at Twickenham on March 3 it was reported that he left the field at half-time "and did not return." He had broken his thumb, an injury which put paid to his rugby career. In more recent times Colin White, the Gosforth prop, was 36 on his England debut in the 15-9 win against New Zealand at Twickenham in 1983. * Numbering conventions were different in the 1940s and 1950s. The No.8 position was previously called the back-row lock (and wore the seven jersey in the 1940s before donning the 14 jersey in the 1950s). For most of the 1950s, and in 1960, England's fly-half wore number 6 and his scrum-half wore number seven.